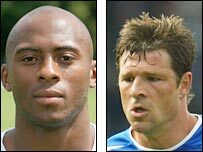 Coventry have completed a double Dutch swoop with the capture of Arjan De Zeeuw and Ellery Cairo. Defender De Zeeuw, 37, joins the Sky Blues after being released by Wigan, and has made more then 400 appearances in English football. Winger Cairo, 28, joins on a free transfer from Hertha Berlin and like De Zeeuw, has signed a one-year contract. Boss Iain Dowie told Coventry's website: "Both have what it takes to be very competitive at this level."